The U.S. dollar is trading lower against most of the major currencies this morning as risk appetite improves after yesterday’s brutal selling. Stock futures are up, helping to bolster pairs like EUR/USD and USD/JPY. However as we begin the NY session, the decline in Treasury yields could also tip the scale and push USD/JPY lower. Yen crosses on the other hand will take their cue from stocks today. The currency most vulnerable to weakness is the Canadian dollar because oil prices are down more than 2% after President Trump tweeted that he hopes Saudi Arabia and OPEC will not cut oil production because he thinks oil prices should be much lower based on supply. Despite a softer Eurozone ZEW survey, EUR/USD is trading above 1.1250 on the hope that progress could be made on the Italian budget front. the expectations component of the ZEW surely also increased. The best performing currency this morning is sterling which is up on higher wages (despite a higher unemployment rate) and continued Brexit optimism. On the Brexit front, we are getting closer to a deal but with some counterproductive headlines, traders are still reluctant to overload sterling positions but when an announcement is made, we can almost be assured that there will be a strong followup rally. AUD and NZD are also up from yesterday but having risen strongly in Asian trade, they are mostly consolidating and even weakening slightly. We also have our eyes on the Swiss Franc which appears to be topping below 1.0130. Short covering flows are strong this morning with most of the major currencies trading higher against the U.S. dollar. Thanks to the much better than expected Australian trade balance and recent tax cuts by the Chinese, the Australian and New Zealand dollars are the best performers. GBP is not far behind as UK Brexit negotiator Raab’s November 21st target for a deal inspires Brexit optimism. The sentiment is so strong that it allowed sterling traders to overlook a weaker UK manufacturing PMI report. Today is an important day for the British pound with a Bank of England monetary policy announcement and Quarterly Inflation Report scheduled for release. No changes are expected from the central bank but adjustments in economic their projections, how MPC members voted and the tone of Governor Carney’s press conference will have a significant impact on GBP. With the currency in short covering mode, a positive outlook should have a more significant impact on sterling than a negative one. Yields are up across the board which should be good for USD/JPY and the yen crosses. Dow futures are also pointing to another positive open for stocks. Non-farm payrolls are scheduled for release on Friday so the ISM report and jobless claims will be particularly important. The JPY and CAD are the primary underperformers and we expect this dynamic to continue. EUR/USD is testing resistance at 1.14 and while its not clear whether this level will break we are inclined to believe that the pair will test this level. Its a risk on day in FX with all of the majors currencies up from yesterday’s levels. Investors continue to be unfazed by the US-China trade war and based on the strength of the Canadian dollar, they are hopeful that with Canadian foreign minister Freeland back in Washington today, progress can finally be made. The best performing currency is the Australian dollar but the Swiss Franc is not far behind. The Swiss National Bank meets tomorrow and investors are unwinding their long CHF positions on the fear that the central bank will harden their criticism of the currency strength. EUR/CHF hit a 13 month low this month and after riding the reversal for +50 pips in USDCHF for a swing trade, we think there will be further profit taking on long CHF positions during the NY session. Sterling is also up strongly this morning on the back of solid inflation data so +GBPCHF could work too but its high vol. Consumer and producer prices accelerated this month, reinforcing the Bank of England’s optimism. The Japanese Yen is trading lower this morning despite the Bank of Japan’s rosy economic outlook. The BoJ left interest rates unchanged last night and said the economy is expanding moderately despite escalating trade tensions. The main focus today will be on US-Canada trade talks and any other trade related headlines as the US only has housing starts and building permits scheduled for release. All of the major currencies are trading higher this morning against the U.S. dollar on the back of gains in Chinese equities. Yields are up, stocks are up and oil is moving higher. After last week’s declines, we’re seeing a turn around on Tuesday. The Australian dollar is leading the gains thanks to a neutral bias of the RBA who sees inflation lower this year but stronger next year. Eurozone data was mixed but investors interpreted the data as positive for the currency and has sent the pair towards 1.16. Germany’s trade surplus increased but exports were flat and industrial production declined. Sterling is up thanks to higher house prices. With no U.S. economic reports on today’s calendar, traders should keep an eye on equities and Treasuries for direction. The trend of dollar weakness that we saw in Europe should carry over to North American trade. The Japanese Yen is trading lower against all of the major currencies this morning after the Bank of Japan failed to raise interest rates. Although the BoJ said they would allow long term yields to “move upward and downward depending on economic and price developments,” they intend to keep rates near zero. They lowered their inflation forecast and pledged to keep extraordinary policies in place for an “extended period of time,” widening the gap between Fed, BoE and ECB policies. The Yen is the worst performer and the strength that we are seeing in USD/JPY, EUR/JPY and GBP/JPY should continue in the North American session. Euro in particular in performing well thanks to stronger Eurozone inflation and German retail sales data that allowed investors to shrug off weaker EZ GDP. Sterling is also up but GBP/USD is struggling to break above the 20-day SMA near 1.3160. AUD is outperforming NZD as the larger increase in AU building contrasts with the drop in NZ business confidence. The US and Canadian dollars are in play this morning with US personal income, spending, Chicago PMI and consumer confidence numbers scheduled for release alongside CAD GDP. The greenback is rising despite a healthy drop in Treasury yields, but the weakness may be limited to pairs like EUR/USD as BoJ could keeps USD/JPY bid. Escalating trade tensions has been good and not bad for the U.S. dollar and thats why we’re seeing the currency trade higher across the board this morning after the Trump Administration released a new list of Chinese products that are subject to tariffs. China plans to retaliate and investors area waiting with bated breath for their response. The currency hit the hardest by these tensions is the Australian dollar which dropped below 74 cents despite stronger consumer confidence. NZD is also very weak which should not be a surprise as the economy’s underlying weakness is exacerbated by trade troubles. Although US yields are down today and Dow futures are pointing to a significantly lower open, USDJPY is aiming for its March 111.39 high. Producer prices are scheduled for release this morning and a good number could encourage USD/JPY to test resistance. Euro is one of the most resilient currencies at the start of the NY session thanks to the relative stability of German yields and the 1.17 support level. Aside from trade, the main focus will be the Bank of Canada’s monetary policy announcement. The Canadian dollar is trading lower ahead of the event but the market is pricing in a 97% chance of a hike. This tells us that investors are focusing more on guidance than tightening. Looking ahead, risk appetite will be key. If stocks reverse their losses, so will currencies but if the Dow falls 300 points or more, many currencies will extend their losses. Investors are buying U.S. dollars this morning on the back of higher U.S. rates and weaker global data. In the Eurozone, the ZEW survey deteriorated in July, causing EUR/USD to finally retreat after last week’s strong rally. We are looking for the pair to test 1.17 but with significant support at that former breakout level, its not clear if there will be a meaningful break. USD/JPY is eyeing its May 111.39 high -- although there are no major U.S. economic reports scheduled for release today, we believe this level will be tested with USD/JPY extending its gains to 111.50. Sterling is under pressure from ongoing political troubles in the UK and softer than expected industrial production. While USD/CAD is up, oil prices hit new highs today and that should limit the pair’s gains. We are short EUR/CAD because we still think CAD will outperform its ahead of Wednesday’s Bank of Canada rate decision. The worst performing currencies today are the Australian and New Zealand dollars. There’s no specific catalyst for their underperformance outside of regional weakness because business confidence increased in Australia and New Zealand credit card spending picked up in June. The U.S. dollar is trading lower against all of the major currencies this morning as the profit taking on long U.S. dollar positions continue. Another way to look at it is short covering on EUR/USD, GBP/USD and AUD/USD positions. The euro shot higher today on the back of stronger PMIs but the rally is fading into the NY session as Germany’s political risks and the ECB’s dovishness hangs over the currency. The Bank of England’s hawkishness took GBP/USD through 1.33. Like EUR/USD the pair is off its highs but unlike euro its doing a much better job of holding onto its gains. The best performing currencies this morning are the Australian and New Zealand dollars but there’s no specific explanation for these moves outside of short covering and anti-dollar flows. The big focus today is on the Canadian dollar. Not only will retail sales and consumer prices be released, but there’s also an OPEC meeting. There’s a growing chance of a formal hike but thats not certain as OPEC officials say this meeting is focused on reviewing fundamentals. Either way, we could see big swings in the loonie today and if data is strong, it could create a top in USD/CAD. The most notable move in the FX markets this morning is in USD/JPY which is testing 110 after having traded as low as 109.25 at the start of the Asia session. There are no U.S. economic reports released today but the dollar is propped by the prospect of a Fed rate hike this week and higher yields. The weakest currency is the Canadian dollar which was hit hard by Trump’s attitude at G7, attack on Trudeau and Canada. Investors are still reeling from Friday’s softer Canadian employment report. The British pound is also under pressure following a series of softer economic reports -- the trade deficit widened and industrial production declined. AUD and NZD are flat but the slide in European currencies and the bid for the USD suggests that these currencies will turn lower during the NY session. The European Central Bank also has a policy meeting this week and while the positive momentum in EUR is fading this morning, we think buyers will swoop ahead of the rate decision. With the week drawing to a close, the rally that took USD/JPY above 110 is losing momentum. Investors are worried that President Trump will stir more trouble at the G7 meeting. He’s widely expected to stick with a hard line on trade, which would amplify criticism and retaliation by other foreign leaders. The pullback in USD/JPY today is driven by a decline in Treasury yields. Jobless claims and continuing claims also ticked higher. There are no U.S. economic reports scheduled for release tomorrow so there’s motivation for a further profit taking on long USD/JPY positions. The U.S. dollar is trading lower against all of the major currencies this morning with the exception of the Japanese Yen. Recoveries at the end of last week carried over to this new trading week with the Australian dollar leading the gains. AUD is up more than 1% on the back of stronger retail sales data, lifting the New Zealand dollar with it. Profit taking on long US dollar positions also helped euro shrug off softer PPI. Today’s U.S. factory orders and durable goods report are not expected to have a significant impact on the greenback. With stocks pointing higher and yields edging upwards, there’s an appetite for risk that should benefit the yen crosses. We also see a further near term pullback in USD/CAD. 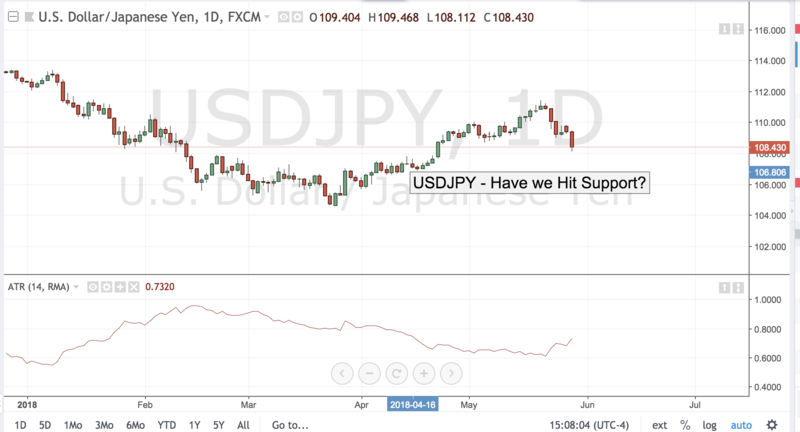 USDJPY – Have We Hit Support? Its been a brutal day for risk as Dow dropped -500 points and Italian political drama upended the markets, but after vicious selloff markets are due for some reprieve. With Italian story now moving off to the sidelines as the country awaits new elections in a few months, the focus shifts to US data as the markets take a look at the first key report of the week -- the ADP employment release. This week is unusual because all of the preliminary data actually follows the NFPs on Friday, so the ADP is the only clue to how strong the payrolls will be. If the job picture in the US continues to perform to expectation the 10Y yields should start to creep back towards 3.00% and USDJPY should follow in turn. The pair appears to have found some support in front of the 108.00 level and if it can hold the lows, a rally back towards 110.00 could be in store.